Tío Pepe-The World’s Most Famous Sherry! Home » Blog » Destinations » Tío Pepe-The World’s Most Famous Sherry! So last weekend when I headed down to the coast for Carnaval in Cádiz, I also got to spend some time in Jerez de la Frontera with my friend Jen. Now Jerez is famous for three things: flamenco, horses, and sherry! On Sunday before heading back to Córdoba, I figured I would tour a sherry bodega. There are several in Jerez but I decided to go with Tio Pepe sherry since it’s the biggest and most famous. You walk into any bar in Spain and they will most likely have a bottle of Tío on the shelf. If you have ever been to Madrid, the name might ring a bell. 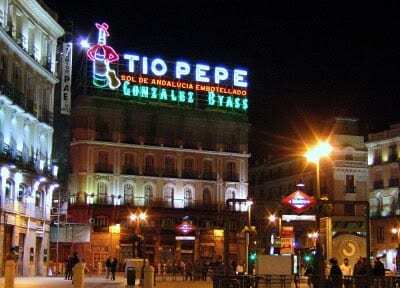 There is a giant neon sign advertising Tío Pepe in the Puerta de Sol, one of Madrid’s biggest and well-known squares. That sign’s been there forever! Honestly, I am not that big of a fan of sherry back home, but I don’t mind it so much here, and I love the way it smells. Now for those of us (ME) who don’t know much about the history of sherry, it’s surprisingly interesting. Sherry is a fortified (strong) wine made from white grapes that grow around Jerez, Spain. In fact the word “sherry” is the anglicization of Jerez (Xerez in the olden days), and it is in fact protected. In Spanish law, if a wine is labeled as sherry, it must legally come from the Sherry Triangle, which is a small area in the Province of Cádiz. Sort of like how real champagne must come from the region of Champagne in France. Now people have been continuously making sherry in this area of Spain for about three thousand years (since the Phoenicians). Although this part of Spain is ridiculously dry and hot, there are winds that come in from the ocean bringing moisture and because the soil has so much clay in it, it retains the water really well, making it possible to grow grapes here. Sherry is produced in a variety of styles, and they come from two types of grapes: the first and most used is called a Palomino grape, and it is used to make a wide range of sherry, from light and dry to heavy and dark. The second type is made from Pedro Ximenez grapes, and they are used only to make sweet, desert (girly) wines. The grapes are harvested in September, and lightly pressed to extract the first round of juice called the must. What a weird word! Anyways, this is used to make the finos. The grapes are pressed again to make the olorosos. The must is fermented in vats for a month which produce a dry white wine with 12 percent alcohol. This wine is then stored in 600 liter casks made from American oak. Right on! They are almost filled, but a space is left at the top so that the layer of yeast may form. The barrels of wine are stacked in four layers, with the newest on top. The sherry is aged in a specific manner called the solera system, where a periodically a portion of the wine from the top barrel is moved into the barrel under it, and so on and so on and the portion taken from the barrel on the ground is removed and bottled. This ensures that there is hardly ever a bad sherry year. Now, Tío Pepe is owned by a company called González Byass, and it was founded by a guy called Manuel María González Ángel in 1835. He named the sherry after his uncle José (nickname Pepe and tío means uncle in Spanish) of course. Spaniards and their families. Oh man. The company is best known for its fino style of very dry, pale sherry made from the palomino grape, called Tío Pepe. They also make brandies here. I decided to take the tour in English and not Spanish since there were about 50 people on the Spanish tour and 3 in the English one. It also let me pester the guide with tons of silly questions about wine/sherry making. We walked all over the grounds and also got to ride around in a golf cart because its so big. I also got to ride in the front. WIN! We went inside many different bodegas and got to see how the fermentation and aging processes worked. It was pretty cool. We also went into the famous room that has tons of barrels signed by famous people. We ended inside a bodega where we got to try to the traditional fino sherry as well as a brandy along with some cured ham and cheese tapas. I think it is totally worth it to tour a bodega in Spain if you get the chance. Me post-tour enjoying a nice glass of Tío Pepe and some jamón and queso tapas! I may or may not have swiped that whole bottle. Might as well get a souvenir!